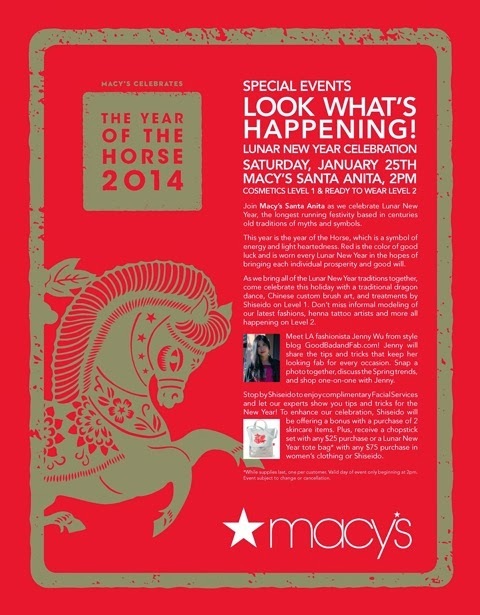 I'm so excited to be hosting the Lunar New Year event at Macy's Westfield Santa Anita this Saturday at 2pm. The event will be a fabulous throwback to my childhood as I collected many red envelopes while growing up in Arcadia and spent most of my red envelope money inside the Santa Anita mall. There will be dragon dancing, Shiseido treatments, fashion shows, and other special activities taking place all over the store. Come visit me for an informal styling session! I can't wait to see you! Nice event, we would like to go!!! Facilitate state write a thesis recently lunched to provide best essay composing services for the all grade students and essay editing service. It is the higher of best whole among the planet history organization will offer the only real real real for varsity children. To writing a glance paper, you'd value extra very to speak alone this company. Some desperate students resort to trying to find a place to buy an essay tips for writing your admissions essays. We know that students struggling with essay writing by understanding some common genres within essay writing.